The ideal model of leadership cannot be fixed a priori. Rather, individuals need to find their own leadership models in the process of self-discovery. The accumulation and analysis of that individual practice of trial and error may lead to the development of an advanced leadership theory, and the university should be the locus of this scholarly work. 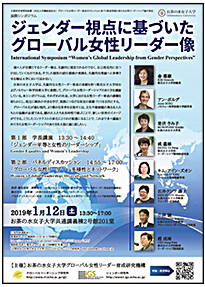 To make progress in the research on women’s global leadership, Ochanomizu University has formed partnerships with Ewha Womans University and the Norwegian University of Science and Technology, which are well known for their pioneering achievement of the promotion of women leaders. This symposium aims to build a foundation for the intellectual exploration and the praxis of the promotion of women’s global leadership. Different cultural backgrounds may bring about different issues and different approaches to solve the issues. Sharing the experiences of these universities offers an opportunity to learn from each other. Cooperation across cultural and ideological lines is essential to realize a more rewarding world in this age of globalization. A new image of a global society can be created by linking disparate people in synchronicity. Being sensitive to such a contextual change should make this symposium a forum for reframing the ever-developing discussion on women’s leadership. Ochanomizu University has commenced collaborative research projects in the field of gender and women’s leadership with Ewha Womans University and the Norwegian University of Science and Technology, on the basis of their respective achievements in research and education. The presidents’ speeches intend to introduce the various initiatives undertaken in their universities for the promotion of women leaders, which are based on the gender perspectives of each of their societies, and to discuss the current issues they face.